[145 Pages Report] The doors market is estimated to be valued at USD 81.67 Billion in 2017 and is projected to reach USD 103.52 Billion by 2022, at a CAGR of 4.86% from 2017. The base year considered for the study is 2016 and the forecast period is from 2017 to 2022. 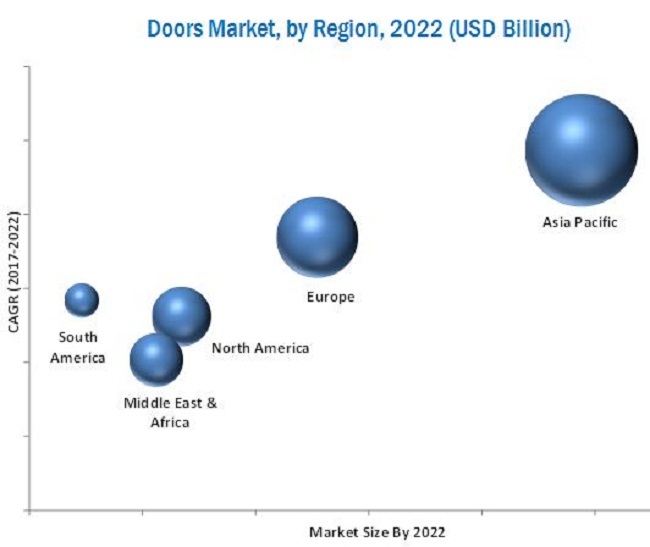 The report aims at estimating and projecting the market size and future growth potential of the doors market across different segments, namely, material, mechanism, product type, application, mode of application, and region. It also provides detailed information regarding the major factors influencing the growth of the market (drivers, restraints, opportunities, and industry-specific challenges). The report further aims to study individual growth trends, future prospects, and contribution of various segments to the overall market. The study also analyzes the opportunities in the market for stakeholders and provides details of a competitive landscape of market leaders. It profiles key players and comprehensively analyzes their core competencies. The market ecosystem includes various stakeholders involved in the supply chain of doors, starting from the procurement of raw materials, research & development, and manufacturing. Post this, the marketing and sales of products take place, which is possible if an efficient distribution channel is developed. Finally, end products are made available to potential consumers. The market for doors is led by major players such as Masco Corporation (US), Assa Abloy (Sweden), Allegion Plc (Ireland), Dorma Kaba (Switzerland), and Masonite International Corporation (US). The doors market is estimated at USD 81.67 Billion in 2017 and is projected to reach USD 103.52 Billion by 2022, at a CAGR of 4.86% from 2017. Some of the major factors that drive the growth of this market are new investments in the construction industry owing to rapid urbanization & commercialization and the changing interior décor preferences of the population. The growing trend of sustainable construction techniques and investment for customizations of doors are also influencing the growth of the doors market. The doors market has been segmented on the basis of material, mechanism, product type, application, mode of application, and region. Based on material, the wood segment is estimated to account for the largest share in 2017, owing to factors such as high insulation, low maintenance, long life, and high aesthetic appeal. Based on application, the residential segment of the doors market is projected to grow at the highest CAGR from 2017 to 2022. This growth can be attributed to the changing preferences and trends, which require renovations and replacements. The increase in the urban population and improved spending capacity have driven the growth of the residential segment in this market. Interior design plays a key role in the construction and renovation sector, which consequently drives the doors market. Asia Pacific is estimated to account for the largest share of the doors market in 2017. This market here is projected to grow at the highest CAGR from 2017 to 2022. 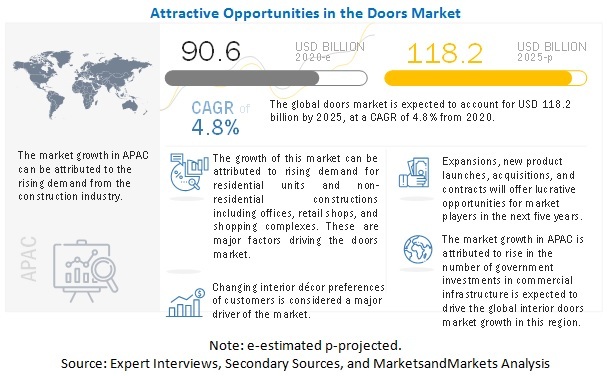 The growth of the doors market in emerging countries such as China and India can be attributed to rapid urbanization and increased disposable incomes. High investment & installation costs for eco-friendly doors are a major factor restraining the growth of the market. The doors market has undergone many changes and advancements pertaining to the technologies and applications used. Materials that are used in the manufacturing of eco-friendly doors are relatively expensive than their traditional counterparts, such as uPVC doors. Consumer demand is steadily shifting towards premium green products in the doors market. The doors market is dominated by key players such as Masco Corporation (US), Assa Abloy (Sweden), Allegion Plc (Ireland), Dorma Kaba (Switzerland), Masonite International Corporation (US), Ply Gem Holdings Inc. (US), PGT Inc. (US), Fancy Doors & Mouldings (US), Simpsons Door Company (US), and Jeld-Wen Inc. (US). These players have adopted various strategies to expand their global presence and increase their market share. These include mergers & acquisitions, expansions & investments, agreements & partnerships, and new product launches are some of the key strategies adopted.